Where to start? This book is deeply affecting and touched on so many of my passions, it is difficult to know where to start. First, it is another entry in the large (and still growing) list of what my friend Hobo Lee used to call Northern California Post-Apocalyptic fiction. Do we in Northern California have a cataclysm fetish? Or do we here in this beautiful and fragile place just wisely wish for an end to this society as we know it before it kills us all? In any case, Starhawk has taken all that she knows from her work as a pagan, anarchist, activist, nonviolent organizer, and created a world that may be our near future. 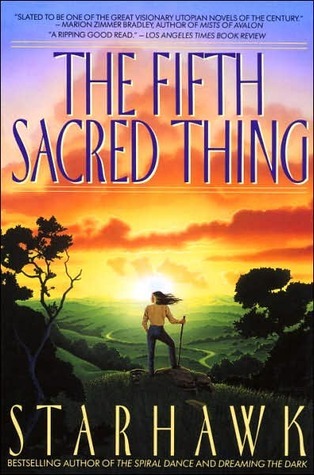 Set in the mid-21st century in San Francisco, an earth-worshiping, polycultural, polyamorous, polytheist culture of nonviolent warriors is pitted against the last brutal and convulsive remnants of industrial society. Primary cultural values of the post-uprising San Francisco are the four sacred things: Earth, fire, water, and air. The story largely follows the fates of the members of one courageous family as they leave paradise for hell to face off against their would-be conquerors. The story is threaded with the themes of spirituality, autonomy, and mutual aid. It debates the nature and effectiveness of violence and nonviolence. It is thoroughly steeped in earth-centered spirituality, anarchism, ecology, and resistance to destruction.